Memory may omit things people say to you, but emotions tied to words spoken are hardly ever forgotten. For weeks I have been searching for a piece of paper with the name of a little girl who I cannot get out of my mind. If I could stretch my memory to recall the name she revealed to me, then I would feel so much closer to this little girl—a little girl who changed the entire direction of my research in Cuba. There is a small neighborhood outside of Havana, Cuba called La Piedra. In La Piedra groups of Cuban-born Haitians and Haitian-born Cubans have found a home. It is here that I met the little girl who now, as I write, has become my source of inspiration. When a friend of mine, a Haitian filmmaker living in Canada, first told me of the community named “La Piedra,” I quickly told him to double back; I knew he was wrong. La Piedra is a community in the Dominican Republic; an isolated, resource-poor community outside Santo Domingo, the Dominican capitol. This community is where I have worked, filmed and built strong friendships during the past four years. In Spanish, “La Piedra” literally means “The Stone.” The harsh farming conditions in La Piedra are a result of land that was once coral, submerged under the sea. When the water left the region, a rough, rocky terrain was left behind. This undesirable land is what poor Dominicans and Haitian immigrants have been left to manage. But my filmmaker friend insisted he was right. I immediately examined whether there was a connection. Haitian people have been subjected to isolation on two separate islands, in communities without the resources that their Dominican and Cuban counterparts have access to. Furthermore, Haitian people on both islands are typically darker-skinned people who face discrimination and exploitation. The similarities were striking. I found that in Cuba, La Piedra was not only home to Haitian people, but also many darker-skinned Cuban people. These groups of people have maintained many syncretic African religions, such as Santería, Abakua, and Palo Monte. In contrast to Havana, La Piedra felt more like Santiago de Cuba, home to the world’s first Carnival, and to the largest population of “Afro Cubans,” a term coined by historians but often rejected by many Cuban people. When I arrived in La Piedra of Cuba, everyone invited me into their homes, introduced me to people, and treated me as if I was a friend. After I was made comfortable, I was offered a beer, and I conversed with my Canadian filmmaker friend. Within moments there were spectators around us, entertained at the oddity of two black people speaking English. We shared a few laughs, and then a little girl walked past. I said something else to my friend and she turned around. She nearly tripped doing so, and looked back again almost three times, her eyes wide, before covering her mouth and running down a rocky roadside. The neighbors laughed, but in seconds she was back with friends. A little brown boy with eyes identical to hers and a girl no taller than her with copper-colored skin and sandy hair clung to her side. They would whisper to one another and then shriek in laughter every time I spoke. One of the neighbors told them to come over to speak to me. I called them over, and they became giddy, making it a game to see whom they could push closer to me. The little girl fell right in front of me, doubling over in laughter. The neighbors were all laughing at how silly the children were behaving. I asked her what her name was. She looked down at the ground and mumbled. I told her my name. She looked directly at me, and smiled like no smile I had ever seen before. She didn’t say anything, just smiled, staring with such an intensity that I waited for her to say something to me, but she didn’t. She continued to stare at me. I think I cried; I know something was released in me in that moment. She’d said something that felt like someone tracing a line down my childhood. She had recovered that moment when I discovered that my color, my history, and who I was, was beautiful. In that moment I realized that for a young black girl in Cuba, sculpting your self-identity is a matter of scrapping from the images that lay at the edges of a culture. She had never encountered someone before who was black and who she aspired to be like. In Cuba, there are many stereotypes of large, mammy-like black women with big red lips and handkerchiefs. Old archetypes from the days of colonial slavery are scattered throughout Havana. But on television, and in movies in Cuba, you rarely see black women. In popular culture in Cuba, the black female image is not an issue of misrepresentation; it is an issue of non-existence. It was not until I went to Cuba, in my brown skin, that I learned what it felt like to be black and Cuban. Discrimination in Cuba caused me to leave the room I was renting because of maltreatment. I was turned away for services at hotels, and people ignored me completely in the street when I was talking to them. 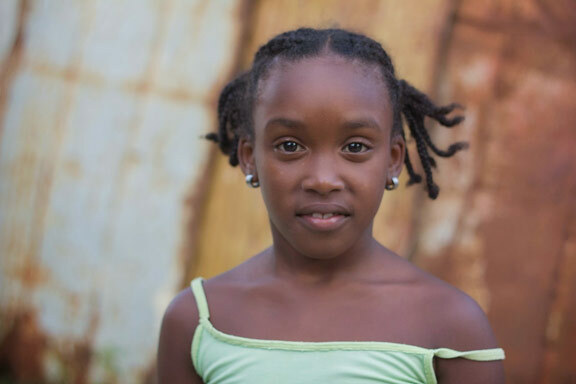 When I met that little girl, my eyes burned with tears because I had gone for weeks in Cuba, questioning why I felt I had been strong enough to come to Cuba alone and conduct research on the one thing that almost nobody in Cuba wants to talk about: race. The next time I saw the little girl I took a photo of her. When I look at the photo now, it is chilling. In it, I see myself. She is nervous, unsure, self -conscious. I see the journey that black women go through to find a level of comfort in their skin and their identities. She did not smile. She stared. She questioned me. I had thought of policy on a larger scale before I went to Cuba, in an effort to examine solutions to racial inequalities. But I have learned that the politics of race in Cuba are personal. How do we break the racism that is within the heart and mind? If this little girl lived anywhere else, maybe I could call her. Or maybe I could email her, send her a letter and be sure that it would arrive at her address. But I am American, and she is Cuban. Her family relies on a phone in the neighborhood for calls, and her parents have no way for me to contact them without it. For now, her name remains to be a mystery to me, but her impact is profound.